As crossovers increase in popularity, car makers are racing to perfect the crossover craft. Mazda and Honda are both creating all-new crossovers to compete in this exciting market segment. Honda released the all-new 2016 Honda HR-V in May of 2015. Mazda has built a lot of hype around the 2016 Mazda CX-3, with anticipated release in fall of 2015. 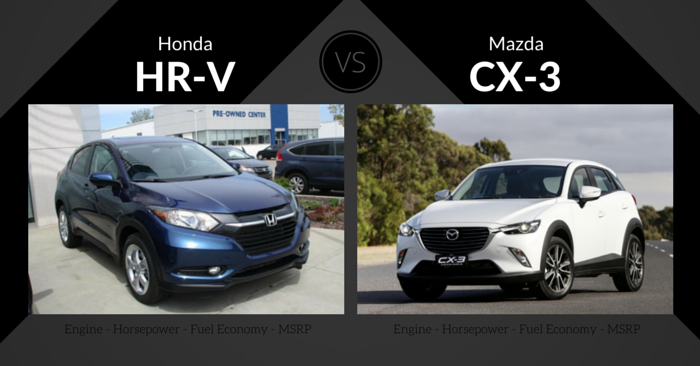 We’re matching up the Honda HR-V vs Mazda CX-3 to see which all-new crossover reigns supreme. Fitting somewhere in between the size of the Honda Fit and the Honda CR-V, the 2016 Honda HR-V may have the “just right” size for many drivers. This crossover almost looks coupe-like from the outside, with slim rear windows and highly embedded rear door handles. This crossover is unique, but is still a clear reflection of Honda styling. It looks like the front of a Honda Fit, the middle of a Honda Crosstour, and the rear is a combination of the Fit and the CR-V. The Honda HR-V is well-organized on the interior. The clean and straightforward design combines well with modern touches like touch-sensitive climate control and optional touchscreen. This tidy layout combines well with the high-tech amenities found in the HR-V. Both the base manual and base automatic options perform adequately in the class. AWD is available, but the added weight will decrease speed and fuel economy slightly. The only other major engine option available is the continuously variable transmission (CVT). Fuel economy of the HR-V is top-notch, at around 31 mpg combined. 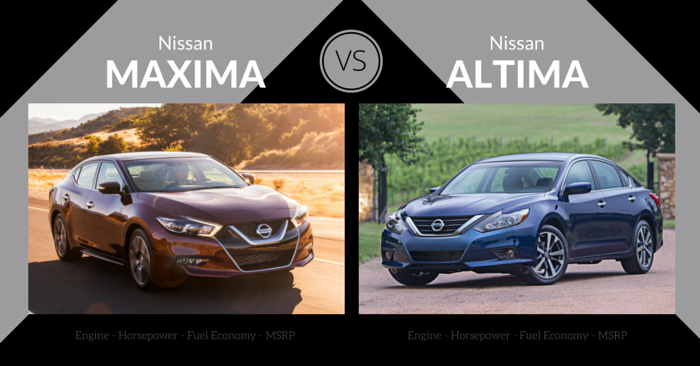 This beats out competitors like the Subaru XV Crosstrek, Chevrolet Trax, and Jeep Renegade. 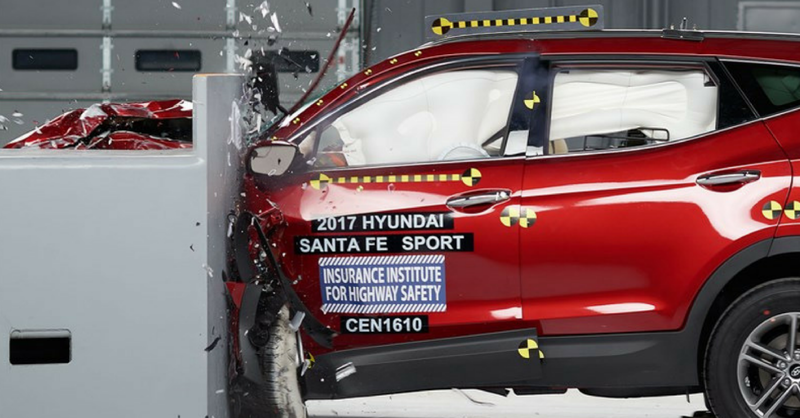 The HR-V has not yet been tested by the IIHS or NHTSA, but we expect the vehicle to perform well. Its little brother, the Honda Fit, is one of the safest subcompacts available today. The CR-V, its big brother, achieves the highest “Top Safety Pick+” honor from the IIHS. The HR-V comes standard with a rear-view camera and LaneWatch. The base 2016 Honda HR-V is well equipped with rear-view camera, 5-inch color touchscreen, Bluetooth, steering-wheel audio controls, and more. Other optional features include pushbutton start, paddle shifters, navigation, 7-inch touchscreen, heated side mirrors, roof rails, leather seats, and more. 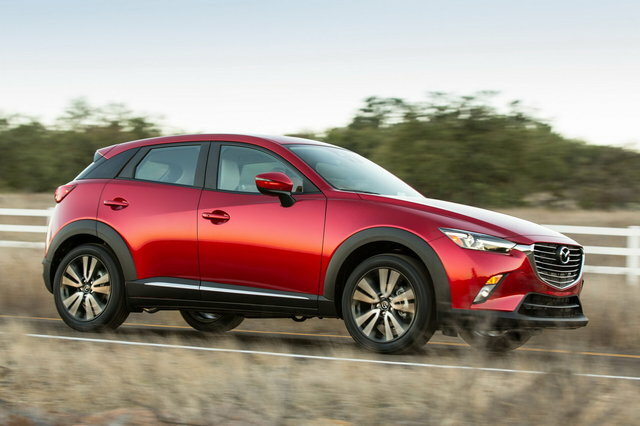 The all-new 2016 Mazda CX-3 has been previewed and driven, but not yet released in the US. It looks like a squished Mazda CX-5. This crossover is characterized by short windows and the familiar Mazda smiley face grill. The package is sporty and modern, fitting for an all-new 2016 vehicle. The cockpit of the CX-3 feels nearly identical to the interior of a Mazda MAZDA3. The design of controls and buttons is simple, and steering wheel controls are added for easy command. The look is modern, elegant, and 100% Mazda. Front seats have ample space for adults, but the rear seats may not suffice for tall adults. Rear seats fold down to create additional cargo space. Mazda hasn’t provided exact cargo measurements yet, but we expect the space to resemble that of a typical hatchback. 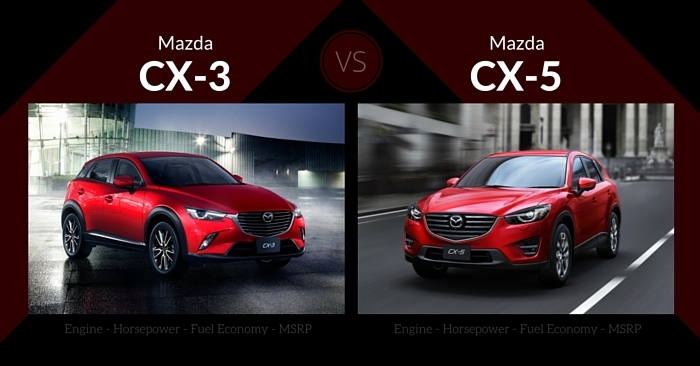 While many crossovers lose engine power for the sake of efficiency, the 2015 Mazda CX-3 is both efficient and fast. The CX-3 has an average sized crossover engine, but has an edge in speed and power thanks to low curb weight and SKYACTIVE technology. EPA figures are not yet available, but we expect the 2016 Mazda CX-3 to perform at the top of the class. The CX-3 should have an EPA combing MPG in the low 30’s, which is extremely competitive. The CX-3 has not been crash-tested, but Mazda has a great reputation for safety. The MAZDA3, MAZDA6, and CX-5 all received 5-star overall ratings from the NHTSA. 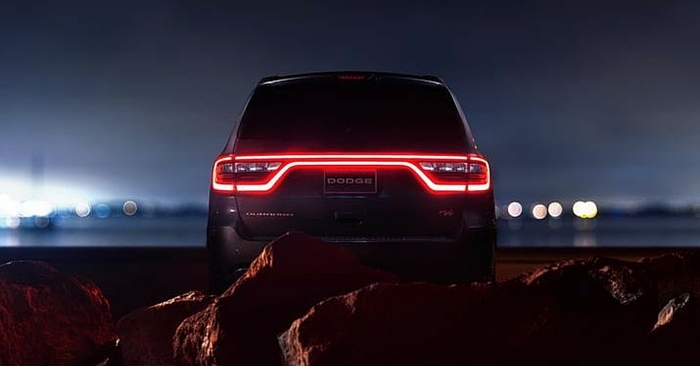 With a standard backup camera and optional blind spot monitor and rear cross-traffic alert, this crossover can be equipped with plenty of high-tech safety features. Even standard Mazda CX-3 crossovers have Mazda Connect infotainment and a 7-inch color touchscreen, remote keyless entry, push-button start, and more. Upgraded options include adaptive headlights, heads up display, navigation, leather seats, paddle shifters, and more. With infotainment on a 7-inch color screen and backup camera in the base model, the CX-3 delivers incredible value right off the bat. Other carmakers still require thousands of dollars for tech upgrades such as these. With a ton of space, great fuel economy, and Honda safety & reliability, the fully stacked HR-V is a great choice. The upgraded HR-V resembles the upgraded CX-3 in a lot of ways, but the HR-V provides more space in the rear seats, giving it a slight edge. When comparing the Honda HR-V vs Mazda CX-3, the matchup is extremely tight. Despite this, the 2016 Mazda CX-3 delivers a slightly better driving experience and more features in lower trims, pushing it ahead of the 2016 Honda HR-V.